It's been a while since I've posted, almost a month. I've been busy. I recently acquired a bunch of new old cameras. My parents shipped me a couple of boxes containing almost every film camera they had, since my dad hasn't used any of them in years since he switched to digital photography. When I was a kid, I remember that there was a camera in my dad's top dresser drawer that was very intriguing, but that we weren't allowed to touch. That camera was in the boxes. It's a Kodak Retina Ia, a completely manual 35mm camera with no meter. It was made by Kodak's German subsidiary in the early 1950s. I'm definitely going to have to ask my parents what the story behind this camera is. Based on when it was made, I figure my dad must have gotten it when he was about 11 or 12 years old. It really is a beautiful machine, and it works very well. I've put two rolls of film through it so far, one black and white that I used at our nephew's first communion a couple of weeks ago, and a color roll that I used when we visited Laura's aunt and uncle and parents last weekend. Since the camera is manual and has no meter, I had to pretty much eyeball things, keeping in mind the "Sunny 16" rule that says that for a camera set at f16 on a sunny day, the shutter speed should be the 1/film speed. 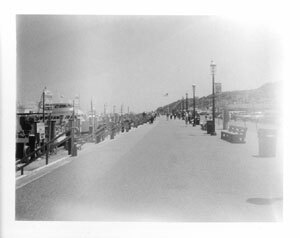 So for 400 speed film, on a sunny day, you would set the camera to f16 at 1/400 of a second (or as close as you can get; the Retina says it does 1/250 and 1/500, but I can only get it to do 1/250). You can extrapolate from there based on whether things are cloudy, you're indoors, that sort of thing. My experience using the Diana and the Holga have stood me in reasonably good stead here; of the shots on the two rolls I've shot so far, only one seems to be grossly wrongly exposed. I'm really enjoying using the Retina. The shutter has a very satisfying feel to it when I take a picture. It may have been the low end of the "good" consumer cameras, but it's made like a tank, and precision engineered. 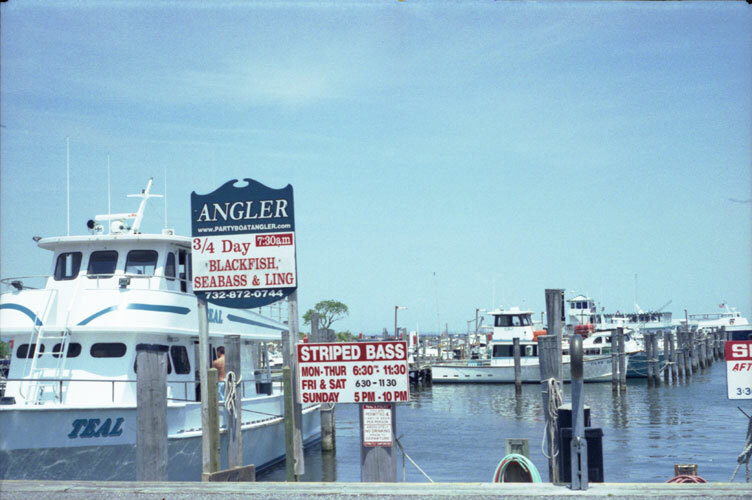 I shot this photo of the harbor at Atlantic Highlands with the Retina. Also included in the boxes were a number of Polaroid cameras. My grandfather was an avid photographer and a big fan of Polaroid. I've scanned photos that he shot with one of their first models, either a Model 80 or 95, I'm not sure, but the prints were clearly of that vintage. He stuck with Polaroid all along, so the two cameras of his that I received were fairly recent. The first, an Impulse AF, takes easily available 600 film. I haven't done anything interesting with that camera yet. The second of my grandfather's cameras I received was a Spectra System. Spectra film is a little less easily available, but I can buy it up at the Rite Aid near my house, or online from B&H or Adorama. The "System" part of the camera refers to all the accessories that came with it, I think. It came with a transmitter and receiver to use for remote picture taking (much much bulkier than the equivalent equipment I have for my Digital Rebel today). It also came with a complement of five filters to place in front of the lens for special effects. This was a big hit at the party after our nephew's communion. I don't post family members' photos here generally, particularly not of the children, so I can't show you the best shots. 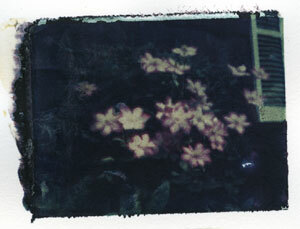 But to demonstrate the effect of one of the filters, I took a shot here at home using one of the prism filters. It's gimmicky I suppose, but it was a lot of fun at the party. 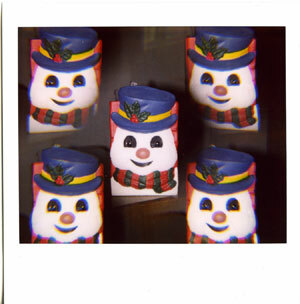 And I think these Polaroid integral film cameras are meant to make gifts to give away. That's the main thing I've figured they're good for, anyway. Sadly, the film for these cameras is very different from the film Polaroid used to make for the SX-70 series of cameras. 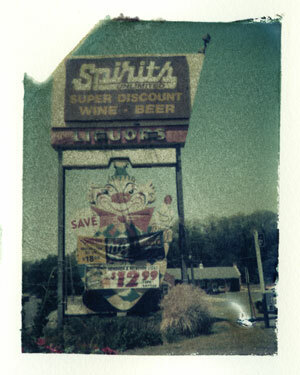 The SX-70 film emulsion was a gel that took a few days to harden. In the meantime, you could manipulate the gel under the poly cover and do some interesting things to the photographs. I dabbled in this a little bit in college with my Polaroid Pronto!, but Polaroid discontinued the SX-70 film last year, so this particular artistic era is all but finished. 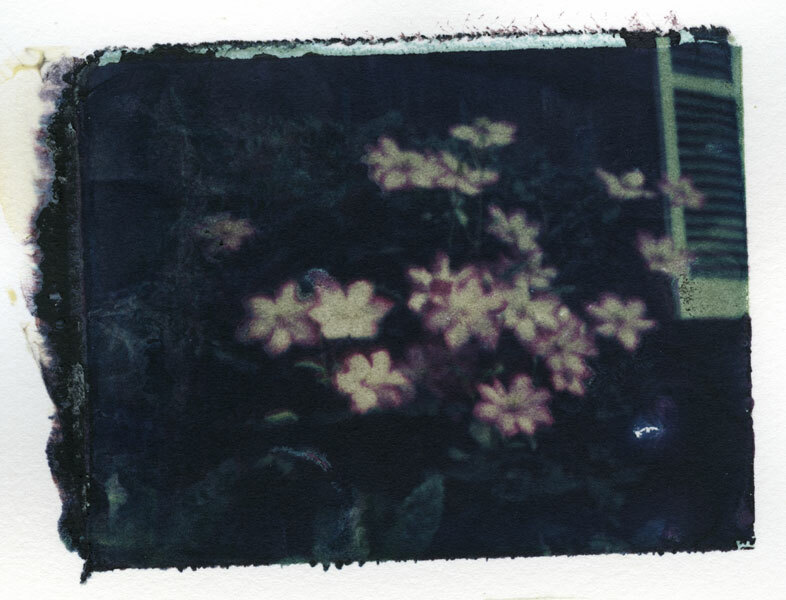 The formulation of the 600 film for the Impact and the Spectra/Image film for the Spectra System is very different, and the manipulation that you could do to SX-70 pictures isn't possible with these films. I tried; it doesn't work. There was a third Polaroid camera in the boxes, this one belonging to my father, and a camera I remember well from my childhood. It's a Land Camera 250, one of the cameras with the peel-apart film that people of a certain age will remember well. Polaroid still makes the film for these cameras, and in fact, actually made cameras that take the film until just a few years ago. It was the top-of-the-line at the time it came out, and has an excellent Zeiss Ikon rangefinder at the top. This is the first rangefinder camera I've ever used. I bought a couple of rolls each of color (669) and black and white (667) film for this camera, which I really looking forward to trying out. I had to get a new battery for it, but other than that, it seems to work as well as the day it came off the assembly line. These Polaroid cameras are really a marvel of engineering, well made, and with a bit of a Rube Goldberg feel to them. They're complex, and a bit complicated to operate, but Polaroid clearly thought about human factors, as there are numbers all over the camera to guide you through the steps. I'm not sure what kind of flowers these are, but they grow on a trellis right up against the front of our house, and they bloom beautifully like this every year. I shot them once in black and white and once in color just to see the difference. Honestly, the color looks almost monochromatic in this instance. But that's not really why I wanted this camera. 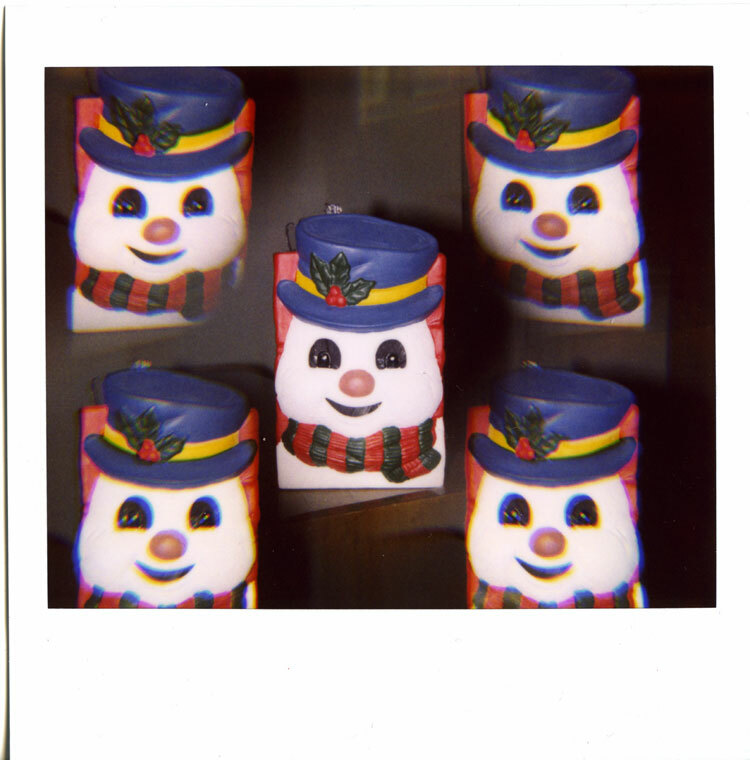 One of the cool things you can do with these old Polaroid color pack cameras is to develop the pictures on something other than the paper provided with the film. This is called "image transfer", and there's a lot of information out there about how to do this, even an entire book. But it's really simple in its essence: you take a picture, pull it out, let it develop normally for about 10-15 seconds, peel it apart, throw away the print, and place the negative on whatever paper you want the picture on. Then you put pressure on the negative using a roller like a printmakers' brayer. There's a color shift involved because most of the yellow dye is gone by 15 seconds, but the effect is pretty neat. The paper you use has an effect; the rougher the paper, the more imperfections you'll get in the transfer. But that's part of the charm. I'm sure you can do this kind of distressing in Photoshop, but it doesn't feel the same. I like doing this with the traditional chemistry. I've done three of these so far. Two were on "hot rolled" watercolor paper, which is pretty smooth and transfers most of the dye. That's what was done here. The third was on "cold rolled" watercolor paper, which a bit rougher and doesn't take as much of the dye. I'm still working on getting this all right, but I'm pretty pleased with what I've come up with so far. There are variations on the technique involving whether the paper being transferred to is wet or dry and how hot it is; I've just done dry transfers, and it seems to work pretty well for me. 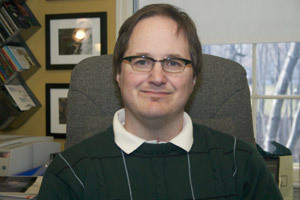 So that's really what I've been up to for the past month, learning these new cameras and what they can do. I'm having a blast. You can see more of what I've been doing on my Flickr photostream if you haven't already. I've added a little widget at the bottom of the right column showing thumbnails of my three most recent photos posted to Flickr.